Which is faster - ADSL (Asymmetric Digital Subscriber Line) or DSL (Digital Squab Line)? If you're thinking pigeons are faster - you're right. Networking enthusiasts gathered at Ohalo, by the Sea of Galilee in Israel. 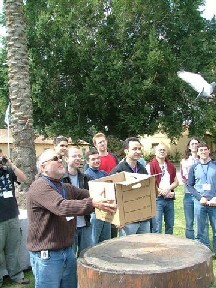 They watched a live test in which three homing pigeons were sent to Ramat Hasharon, some 100 kilometers away. Each of the pigeons carried tiny memory cards with a total of 4 gigabytes of data. Pigeon-powered data transfer was pioneered in Bergen, Norway, using a data protocol defined by David Waitzman, an American computer scientist - CPIP (Carrier Pigeon Internet Protocol). 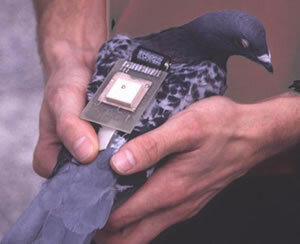 Pigeons have long been used for remote data transfer. In the 19th century, roving reporters used handy pocket pigeons to report back to the home office, getting around the then-clumsy fixed infrastructure of telegraph (see illustration below). The data transfer would be timed from the release of the pigeons to the arrival of the last pigeon. Haim Sperling, veteran pigeon breeder from Ramat Hasharon, was in charge of infrastructure, supplying the three pigeons named Blue Sky, Two Colors and Dotted Light. The results? Dividing data carried by time elapsed shows a data transfer rate of about 2.27 Mbps (million bits per second), a significant improvement over standard ADSL connections. Drawbacks? Very large packet size, in this case a little over 1 gigabyte. This also increases the problems with lost packets. In the this experiment Dotted Light almost failed to arrive. Pigeon routing systems are poorly understood, making it difficult for engineers to correct problems. Studies on cerebral lateralization of homing are still in progress. Also, as was pointed out in WWII, during operations using PGP (Pretty Good Pigeons), problems with hacking by the enemy were encountered. Fans of Frank Herbert of course remember the distrans, a system of encoding messages onto the nervous system of bats. The transfer rate is not given in the books. Read more about it at Pigeon-enabled Internet is faster than ADSL.